Yellow Creek Casting Co. Inc.
Yellow Creek Casting Co., Inc.
See our Video below to watch us pour! Ycc ladle crew hard at work. Pictured above is one of our recently made troughs in action. 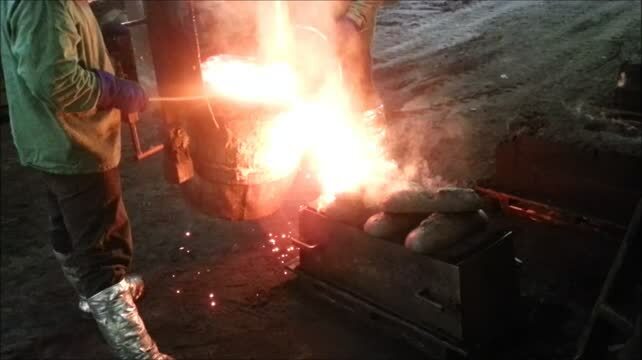 At Yellow Creek Casting Company, we use more than 75 years of combined experience to make scratch-resistant cast-iron friction guides that save our customers time and money. We also provide the best , round-the-clock service in our business to prevent downtimes, keeping schedules and budgets in check. Let us meet your needs, then you'll understand why Yellow Creek Casting Co., Inc. has earned an outstanding reputation with leading steel producers and processors from coast to coast. You Want It When? ...................... NO PROBLEM!! !